Royston Cartoons: Pen talk: Non-cartoonists look away now! 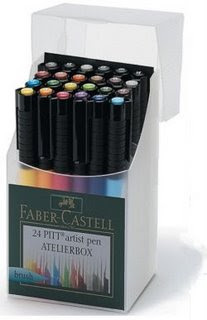 Here's a tip that I got from the US Wisenheimer cartoonists' forum that will be of interest to anyone who uses Faber-Castell PITT brush pens. If you do use them you'll know that the nibs can go flat very quickly. But because they usually still have lots of ink in them, I tend to hang on to them, sometimes using them for filling in or for roughs. But Canadian cartoonist Michael McDonnell came up with this tip: If you take a pair of tweezers you can remove the nib and turn it around giving you a brand new brush tip to work with. I've tried it and it works a treat. And I've since found that I have about 40-odd blunt pens stashed in various drawers and jam jars around my office. They can all be used as new, which means I've saved myself about £75. Hurrah. Thanks again, Michael! Brilliant tip. Just tried it, and it works just as you describe. Will you be posting this tip on CCGB? Hi Clang, actually I posted it on the CCGB forum the same day I wrote this blog entry. In order to keep the moderators happy I posted it in the "How to" section. I always reckon no one really looks at those areas, and you've just proved me right!